Thank you everyone who commented or emailed me regarding yesterday's search for Amy Butler's Coriander fabric in Pink (Sunday Stash #30). I now have several swaps happening and was also able to make some online purchases which will keep me well stocked of this fabric for some time to come! Thanks again! I will be doing a post office run today to send off this baby quilt to its new owners! The quilt measures 35 inches x 65 inches, and has been quilted with straight vertical lines. The back of the quilt also features some piecing. 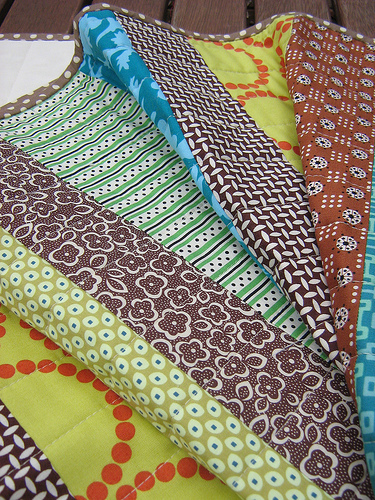 This quilt is off to Wes and Layla who are in the process of adopting a baby boy from Ethiopia. Which makes this quilt rather special, and I know it will be much loved. You can read more of Wes and Layla's adoption journey here. 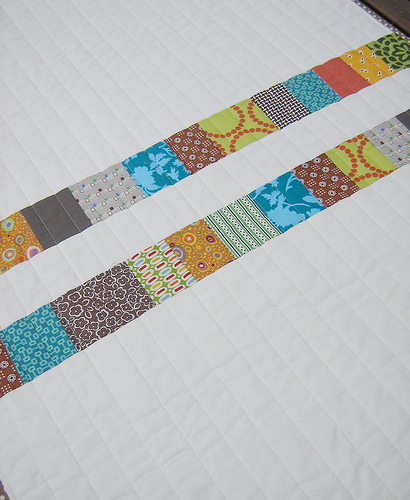 I receive many queries regarding binding, and especially machine stitching the binding, and have therefore prepared a tutorial or at least some tips on how to I like to attach the binding by machine for all of my quilts. It will be posted tomorrow. Rita - That is such a special story to have been a part of! Made in lightening speed I see! Thankyou for sharing ... as always! Both of these quilts are beautiful and sound like will be loved very much. Beautiful story - beautiful quilt. The quilt is lovely. 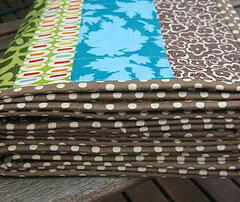 I love that last photo of the quilt all folded up and the binding on display. Can't wait for your binding tutorial. A lovely quilt that I'm sure will be loved to pieces!!! That quilt is beautiful!!! I'm looking forward to that tutorial---I'm always baffled by machine stitching it on! Rita!!! I received my labels today!!! Go to my blog and see how cute they are!! Looking forward to your tutorial. I'd love to be able to do bindings 100% by machine. Beautiful quilt and going to wonderful people for a beautiful baby. Another wonderful quilt and this one with a story to go with it. I remain constantly amazed at your output. 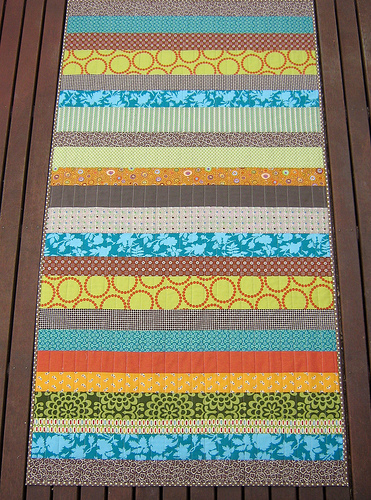 I spent most of yesterday attaching and blind stitching a quilt and still didn't finish it! Where do you find the time??? Do you wash your quilts AFTER you're finished? they are always so perfectly flat....and usually a washed quilt has that antiquey wrinkly look. Can't wait to hear your advice on binding - I can't help thinking that machine stitched binding is so much stronger than hand stitched. Especially when you are making quilts for children and every day use. It is beautiful. I love the quilting on it! You've inspired me to try my own quilting. I think all my machine could handle are straight lines, so thanks for making me see how cute it can be!